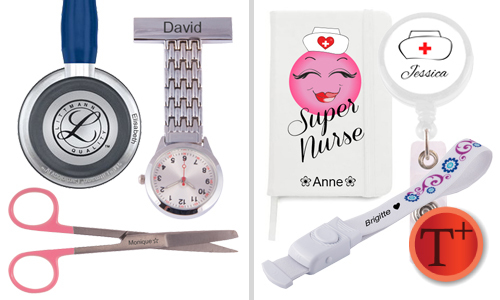 Give your new watch, stethoscope, tourniquette, badge holder or other products a personal touch by having your name or initials engraved or printed on it. It's a great gift idea! Have a watch with a name or a special text engraved to give to someone. The engraving service can be used for watches with a metal brooch pin or select from our wide range of penlights and stethoscopes. To engrave a product first click on the watch and / or products you want. Under the product description will be a section where you can select the engraving service option and enter your text. If the engraving option does not apear under the product descrition then this product is not available for the engraving service. no delay - processing time for engraving service! Ordering engraving service before 03:00 PM (GMT+1) same day dispatch! Once you enter your text in the box under the engraving service option, the cost is directly added to the price. Always double check that you have the correct spelling! Note: personalised products can not be returned.